Key difference: In financial accounting or bookkeeping, "Dr" (Debit) is the left side of a ledger account or when something has been deducted from the account, whereas "Cr" (Credit) is the right side of a ledger account, when something has been added. Every debit transaction must have a corresponding credit transaction and vice versa. Debit and credit are the two fundamental aspects of every financial transaction in the double-entry bookkeeping system. Under this system, every debit transaction must have a corresponding credit transaction and vice versa. An entry or the total shown, on the credit side. Essentially, debit and credit is a system of notation used in bookkeeping to determine how to record any financial transaction. In financial accounting or bookkeeping, "Dr" (Debit) is the left side of a ledger account or when something has been deducted from the account, whereas "Cr" (Credit) is the right side of a ledger account, when something has been added. Due to this many believe that since credit adds, so it is good, whereas debit deducts, so its bad. However, that is not that case. What many people fail to understand is that every credit and debit transaction has a corresponding debit or credit transaction. For example, take a customer's bank account, when the customer deposits cash into his bank current account, his account gets credited, however, what he fails to understand is that his cash in hand gets debited. When he withdraws money or makes a purchase, his account gets debited, but his cash in hand or his assets (i.e. materialistic products) get credited. The terms, debit and credit are also used in the case of cards, i.e. credit card and debit card. The difference between debit cards and credit cards is that the debit card allows the account holder to withdraw money from his account or make purchases, where the cost will be automatically debited from the account. Credit cards also allow one to make purchases, however, the bank account is not debited, but instead the credit card account is credited with the purchase. At the end of the billing cycle, one gets a billing statement for the total amount as well as any interest applicable. 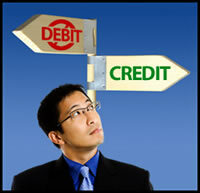 Credit is terms related to "deposits" and debit is terms related to "withdrawal".